Stretching exercises improve flexibility and workout performance, AND aid recovery. But when it comes down to stretching, are you stumped? Only remember the same old basic stretches every time that you're SO bored of? If so, then this is the perfect page for you. I've tested out a couple of products and can now give you my BEST recommendations for done-for-you stretching exercises. The DVD has over 40 flexibility exercises that both a male and female demonstrate for you. The best thing about the DVD is that you get to see the exact movement that you should be performing. If you are a visual learner and need to see real life examples, then I definitely recommend this DVD. What's more, they explain how certain stretches can help with injury rehab and back pain. Also, if you need to print stretches out then this stretching exercises DVD also allows you to do that too. The only negative I can think of with this DVD, is that if you're an advanced exerciser then this probably isn't for you. Personal Trainers *should* know all this info already. But, if you are trying to keep motivated with exercise, or getting back into it, or simply bored and out of ideas of how to stretch, then this DVD is a must have. Get more Stretching DVD information here. These three charts have almost 50 stretching exercises on them, displayed with an anatomical drawing and explanation of the stretch and the muscles used. These are large charts (approx. 23" x 33") printed on quality glossy paper. They look very professional. The three stretching charts are grouped into "lower body stretches", "upper body stretches" and "neck, back and core stretches". At first you might think "oh what do I need these for?!". But I guarantee these charts will give you a much greater insight into which muscles are being stretched and their locations in your body. That knowledge will help you stretch better and improve your stretching flexibility beyond what you could previously do. You would expect to see charts like these in every gym. They have been such a great resource for me because they're right there in front of me. A quick glance and I've refreshed my memory on the stretch. Their professional quality means that they're also a great resource for fitness and healthcare professionals. 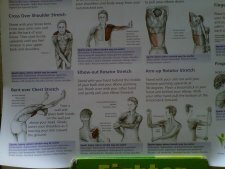 If your job involves working with muscles in any way, then I recommend you snap these anatomical stretching charts up. Get more Stretching Charts information here. The InstantStretch™ software has been made specifically for fitness and healthcare professionals. It is a program to create pre-loaded and/or customized stretching programs for clients. I found it straight forward to use, if you can follow simple instructions then you can use this program. What it produces is actually a slick and professional looking PDF document that has your client's stretches laid out for them with photos and descriptions. Whilst making each stretching program, you simply follow the prompts and customize as much as you want by choosing which stretching exercises you want included and any extra information you want to write with it. I've used it to add value to my Personal Training packages. It's something extra that most trainers won't be offering to their clients. As we know, stretching and flexibility can make all the difference when it comes to recovery and staying injury free. Get more InstantStretch™ Software information here. More fluid movement patterns, greater power, strength, endurance, and increased resilience to injury. Return to Warm Up Exercises from Stretching Exercises. Return to Better4Fitness Home from Stretching Exercises.